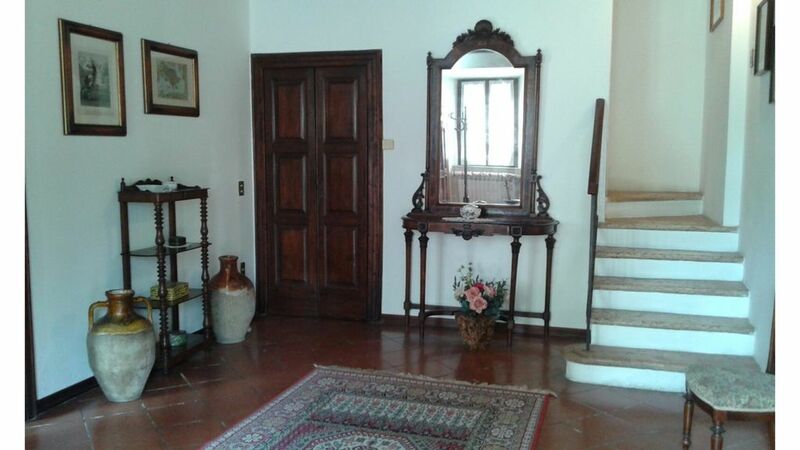 A large country house surrounded by greenery with three bedrooms. Immersed in the greenery and in the shade of lush plants "Corte Caselle" offers a serene comfort in the peace of the typical Mantuan countryside. The ancient remembrance of walls and rooms of a typical peasant house reappears childhood memories, open air games with the scent of grass and the past. Large and mobile rooms that transmit feelings of warmth and intimacy and invite you to relax. An experience of past feelings and many other emotions of country life long ago. "Corte Caselle", easily reachable from the highway, is just a few minutes from Mantova, a city of art with ancient rural traditions. Every corner of the house speaks of a peasant reality in contrast to elegant furnishings with period furniture in every room. A rustic yet elegant and comfortable environment. The ceilings with authentic beams restored to the rule of art give the environment an authentic rural structure but refined details of the casual homes of once. On the ground floor the large lounge overlooks the large park, which recalls the typical atmosphere of the Mantuan farmhouses, and the long rows of tall Cypress poplars allow you to enjoy a cool shade. Always on the ground floor the characteristic and large masonry kitchen, equipped with antique fireplace, allows you to cook and consume the meal on the large antique table. Upstairs three large bedrooms and a quaint bathroom, designed personally by the owner, in the liberty style. Outside, under a comfortable open porch, facing the orchard, a space equipped with an old wood-burning oven, a vintage marble sink, a table with benches to enjoy outdoor culinary moments. Adjacent to the porch a large barbecue to cook in the company of wonderful grills. In the same building there is a convenient laundry / dispensing compartment with two washing machines and two washers. The tranquility of the place and the spacious spaces make for a relaxing family or company break, as well as a romantic stay immersed in nature and away from stress. In the immediate vicinity, you can enjoy the authentic and genuine Mantuan cuisine in the charming agritourism of the area. Mantua, a city of art, is together with Sabbioneta inserted in 2008 on the UNESCO World Heritage List; Both of them shared by the precious legacy left by the Gonzaga that made it two of the major centers of the Italian and European Renaissance. The city is a true urban museum rich in prestigious religious and civil architecture that witness the passage of great artists such as Giulio Romano, Andrea Mantegna, Leon Battista Alberti and Luca Fancelli. A pleasant walk through the city allows you to enjoy the view of the Ducal Palace, the Castle of S. Giorgio, of the Cathedral of S. Pietro, of the great square Sordello and then Piazza Erbe with the Palazzo del Podestà and Palazzo della Ragione, the Basilica of S. Andrea, the Rotunda of S. Lorenzo, the magnificent Teatro Scientifico by Antonio Galli Bibiena, the Teatro Sociale, the Church of S. Sebastian to Palazzo Te. Within each of the paintings of rare beauty. For those who love bicycling, there are interesting routes in the surrounding countryside to reach, with the existing bicycle, Lake Garda. In the nearby village of Stradella you can rent a car. The proximity to the Mantua Nord exit of the A22 motorway (three kilometers from the farm) makes it easy to reach many tourist destinations: Lake Garda, Verona, Padua and Venice to the north, Parma, Bologna, Cremona to the south. Maison très vaste et agréable dans son jus entièrement équipée. Un grande piacere accogliere voi nella nostra casa. Avete apprezzato la campagna e giustamente portato le bici con voi. Grazie per averci scelti. Das Haus liegt günstig in dörflicher Ruhe vor den Toren Mantuas, und eignet sich als Ausgangspunkt für die Erkundung der Region. Das weitläufige Haus ist komfortabel ausgestattet, die Vermieterin war sehr freundlich und stets telefonisch erreichbar. Verständigung in Englisch war kein Problem. Im Vergleich mit dem Haus kann die Gartengestaltung- und Ausstattung leider nicht mithalten. Wir haben uns in dem grossen alten Gutshaus sehr wohlgefühlt. Da wir nur zu dritt waren, stand uns mit dem riesigen Wohnzimmer, der Diele, der Wohnküche und einem Bad im Erdgeschoss und mit den 3 geräumigen Schlafzimmern und einem weiteren Bad im Obergeschoss sehr viel Platz zur Verfügung. Die technischen Geräte in WoZi und Küche waren nagelneu und qualitätvoll. Das Mobiliar und die vielen Accessoires aus alten Zeiten (um 1900) verbreiten eine gehobene, leicht museale Atmosphäre. Bei technischen Problemen kam der Vermieter immer schnell von Mantua herbei. Er spricht englisch und französisch, die studierende Tochter fließend deutsch. In seinem Elternhaus wohnen zu dürfen, erlebten wir als Gastfreundschaft. Dafür herzlichen Dank! Le tariffe sono indicative e possono essere modificate in base alla durata del soggiorno e alle specifiche richieste da parte degli ospiti.